Bah Humbug; now that’s too strong! ‘Cause it is my favourite holiday. But all this year’s been a busy blur. Don’t think I have the energy. Not my words of course but those of the Waitresses in their 1982 post-punk Chrimbo classic Christmas Wrapping, which as well as coming on when I put the office Spotify on just now, is entirely apposite because a) that’s kind of how I feel as 2018 comes to an end, and b) Christmas Tree Hair is back. Maybe it’ll cheer this old Scrooge up. That tune definitely has – total classic. And much like the tunes which repeat on a yearly basis, another Christmas thing is becoming a tradition, and tbqh I can’t wait for Christmas 2019 to come round if this is the case. I wonder where the tinsel will go next? Christmas Tree Hair – or CTH if you want to make it sound like some kind of medical infliction – first came down the chimney in 2016, filling up Instagram feeds with impossibly structured towers of hair stacked like… um, Christmas trees, obviously. Much like all things Christmas which seems to get bigger and brighter and more expensive each year, so too has Christmas Tree Hair, with people becoming extra, inserting fairy lights, baubles, reindeer (decorative not real, that would just be wrong) and elves on shelves. I’m starting to think I should make a bit more of an effort with my tree if people put more effort into their hair. 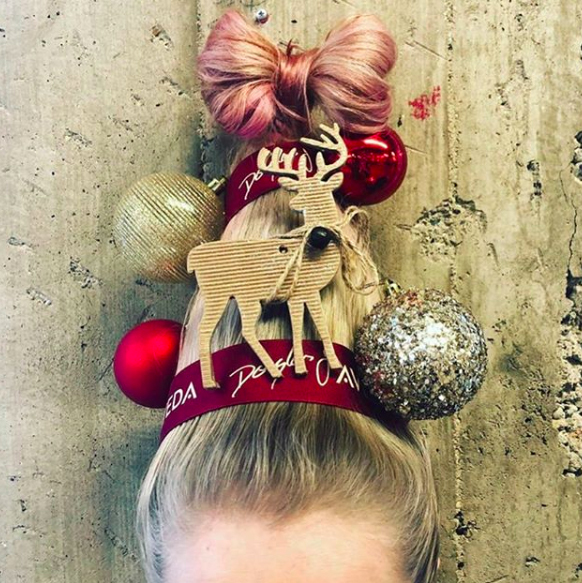 Check out this crazy Christmas tree inspired hair! Not got enough hair to wrap into a Christmas tree? Fear not. You can now get fairy lights for beards! 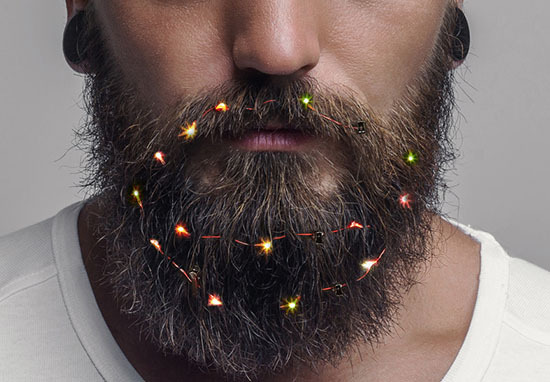 The festive fairy lights for your face are sold by Firebox, who say: ‘Basically it’s fairy lights for your beard’. Not got room for a Christmas tree in your dismally small rental flat? Join the club! Don’t bother with one of those dinky desk sized ones, just get these and make yourself the tree this year. Forgo the waxy styling products and replace them with this set of 18 multi-coloured nano LED lights – but don’t worry, you don’t have to hang them individually. Each of the heat-less lights are suspended on a 90cm cable that clips onto your beard painlessly. Just like normal fairy lights, but miniature so they nestle comfortably in your face fuzz. Trust us, you can’t even tell they’re there when they’re in, so unobtrusive. We tested them on our extensive range of hirsute staff members and they all agreed. They also give a word of warning – if your beard is wet, give the lights a miss. A bit of spilled champagne dribbling down your chin won’t hurt, but everyone knows moisture and electricity don’t mix well. Another meaning to the term ‘drink responsibly’ then. Btw in the time it’s taken me to write this article Last Christmas by Wham, Santa Tell Me, Don’t Let The Bells End and Last Christmas by Taylor Swift have all come on the office playlist. CHRISTMAS!